Once again up with a software that works really well in the very new Microsoft’s Windows 8 OS. However, it’s a Twitter Client this time. Yup…tried out some social networking desktop clients that work absolutely well in Windows 8. Developers have, at last, started programming Software for Windows 8 and after a quick R & D, I found Twhirl desktop Twitter client for Windows 8, working awesome in Windows 8. Twhirl is a desktop Twitter Client that lets you access your Twitter account from within the desktop software. The features that are available to you over Twitter Social Networking website, can be accessed via Twhirl, as well. This Desktop Twitter Client has been built upon Adobe AIR Platform and comes up with various supplementary services at one single place. Let me quickly brief out the features of Twhirl Twitter Client For Windows 8. Installing Desktop Twitter Client In Windows 8 is as easy as it is to download it on other OS such as Windows 7, Windows XP, and the like. Lets me quickly jot down the installation procedure of Twhirl. Also, check out our post on Windows 8 Editions. Go onto the homepage of the Twitter client. Under the “Download” menu, click on “Download Twhirl 0.9.7” given link. Click on the downloaded set up in order to install. Desktop Twitter Client will soon get installed as you keep following the on-screen instructions. Yupp…there you are. You have successfully installed the Twitter Client in Windows 8. In short, Twhirl is a one of the best Desktop Twitter client to access Twitter right from your Desktop screen. 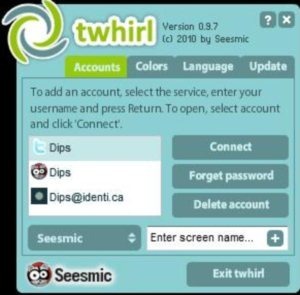 Go ahead and try Twhirl now…!